As I mentioned in my self-introductory post, sewing & quilting was my "gateway drug" into the online crafty world. 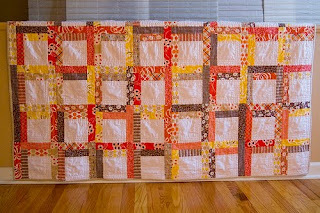 In fact, my first experiences with discovering and reading blogs was when I stumbled upon some wonderfully inspirational quilting sites like Amanda Jean's (now, sadly, defunct) Crazy Mom Quilts site and modern quilter Jacquie's Tallgrass Prairie Studio site. But there was one blog that I was drawn back to again and again because of this crafter's beautiful aesthetic and her plentitude of amazing projects: Rebekah's blog, dontcallmebecky. But I digress. 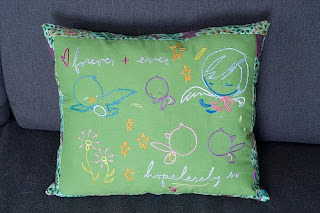 Since this is an embroidery blog, I wanted to share a favorite project of mine from Rebekah's collection. 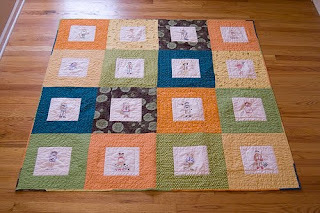 Take a look at this quilt featuring all 16 of the "Four Season Stitchette" patterns by Wee Wonderfuls. I love how Rebekah used a basic quilt square to really feature her amazing stitching, and selected a bright palette of fabrics that really complements the tone of the illustrations. This project really opened my eyes to the endless creative possibilities that can happen when you combine embroidery and quilting. Isn't it an amazing creation? I just wanted to feature it because I love it so much! Here's a link to all of Rebekah's embroidery posts from her blog -- she's got so many other amazing projects that I could go on & on ... but too much to feature in just one post. Go take a quick visit to see what Rebekah's up to over at dontcallmebecky ... and tell her I said "hi"! 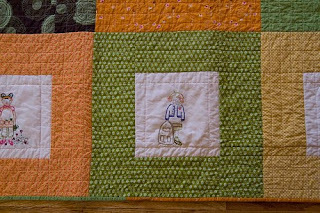 I also made a stitchette quilt a few years ago also, I just love those patterns!